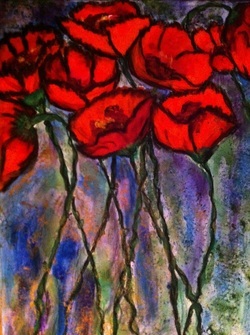 Poppies was completed as a study in color for the Aurora Series of glass. It was donated to the Anchorage Museum Gala in 2011 & is now in a private collection. 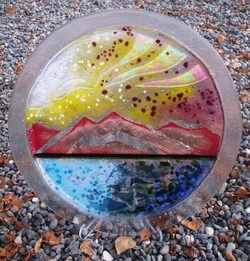 Aurora Over Waldorf was created specifically for the Anchorage Waldorf School in 2010. 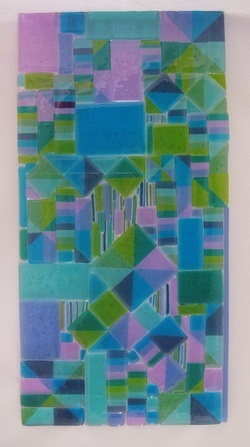 Large 24" X 48" panel of geometric pieces all left over from another large installation. Heavy duty & double wide gate. Has withstood wind, rain, snow & a lot of use! 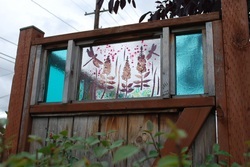 Glass & copper accents with transparent colored panels on the border. Custom piece created for a wedding. 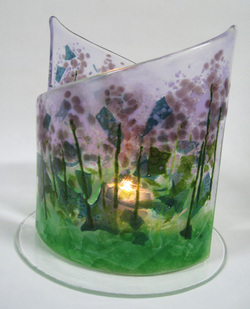 Can be filled with candles or flowers or both! 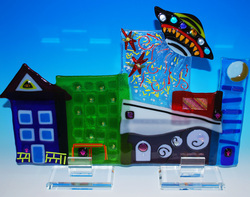 Aliens Over Anchorage was a piece that was specially created for the 2010 Museum Gala Fundraiser. Large 36" wide by 28" high. 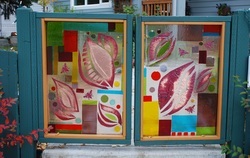 In custom plexi stand.